March 22, 2016 – The Board of Directors of Blue Ridge Mountain Host joined members and guests for a regional tourism networking event at the historic NuWray Inn in Burnsville NC on March 22nd. There were hosted by couples/owners Eric & Christy Wilson and Joey & Jill Farmer. The Wilsons & Farmer’s purchased the 3-story, 16,500 squarefoot clapboard colonial in September of 2014. It features 26 guest rooms and a now offers an all-you-can-eat family style restaurant Fridays through Sundays. 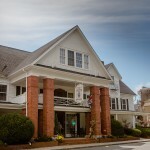 The Inn has been featured on ABC News and was the only North Carolina property included in Architectural Digest’s 1978 book set entitled “Classic Country Inns of America.” Originally expanded out of a log cabin, the NuWray Inn has been taking in guests since 1833, the same year Yancey County was formed and a year before the town was established. The Inn sits on Burnsville’s Town Square and is listed on the National Register of Historic Places. Its guest register includes such luminaries as Thomas Wolfe, Mark Twain, Jimmy Carter and Elvis Presley. Presley stayed in room No. 9 during a visit in the late 1960s while looking for property. That room is now the Elvis Room and includes a few mementos of his career.